I miss Clinton Portis. You miss Clinton Portis. 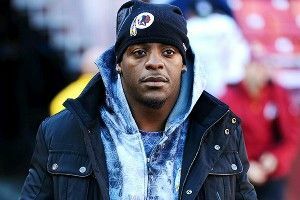 We all miss Clinton Portis, I think, which is why it’s exciting that the indispensable D.C. Sports Bog noted on Tuesday that Portis is set to appear at an upcoming fund-raiser for President Obama, hosted by Vice President Biden. Are we one step away from a Biden Pockets Straight shirt hitting the market? I really, really hope so. So it’s OK to have countless artesian, Deadwood-style saloons for hipsters where you can get boysenberry ginger beer fizzes, but people going to next season’s Brooklyn Nets games can’t get lit off $9 watery domestics? Have you SEEN the Nets play? You should be slammered from tip-off. You’ve changed, Brooklyn.